This program can make your dreams come true. Faster window switching while playing warcraft. [Ctrl] + [Home] will also run Warcraft3 or toggle the window from maximized or restored state. 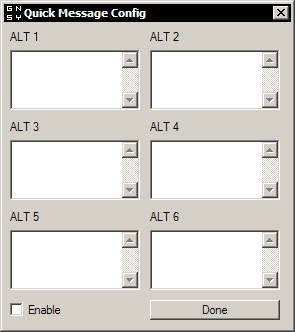 a toggle button that will either maximize the warcraft 3 window automatically when checked or do nothing when unchecked. this is disabled by default. a toggle button which enables the built in inventory hotkey if checked and disables it when unchecked. this is enabled by default. the program will run on computer startup if this is checked. unchecked by default. -another quick update. the file i uploaded was corrupted. -mouselock set to off by default. -quick update. found bug with mouselock. fixed. -added option to disable the left windows key. I did not put a mouselock when it isn't in restored mode. so you can't rly play on restored mode unless you download a mouselocker. -when you start the game you must manually make it fullscreen it won't automatically do it for you. -doubleclick the icon and it will run warcraft for you, if warcraft is already running and you double click the icon, it will check if the warcraft window needs fixing to maximize it. 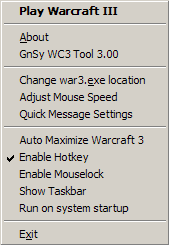 -hotkey is enabled by default. disable it if you're using another hotkey, it stays disabled when you disable it so you don't have to keep disabling it when you run my program. - the system tray balloon pop up (shortcuts list)will now only occur once and will never pop up again unless on a different pc or the registry was somehow cleaned. You can recheck the shortcut list on the menu. - added feature to make sure the program may only have one instance. - added a code that would make sure if the game is maximized. - now added some options to fix bugs. Virus Scan : Click ! thnx (alt+1 "run forest run") xD!